has been MIA for the past two years. Deep in the Alaskan wilderness. 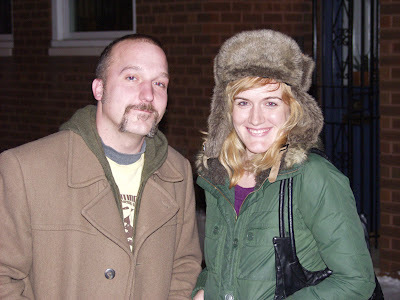 Only to appear on our doorstep last night rocking a Lemmy 'stache. Ladies and gentlemen, I give you Mr. Dave Kapla. I will soon be posting some amazing videos of his adventures in Alaska. On a completely unrelated note, I did indeed go to the emergency room this weekend. Let me advise you dear readers if someone offers to put a scope all the way up your nose so they can look into your trachea (even if they are a supercute ENT specialist, especially if they are...) you should politely decline. Very glad to hear you are sans fish bone in the throat. That must have been scary. why are you the one who looks like the alaskan in this picture? you look like you just walked in off the bering strait.